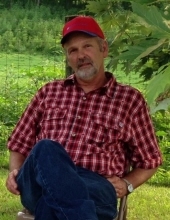 David Bryan Hord, age 59 of Tollesboro, beloved husband of Kimberly Hord, passed away peacefully at home with his family by his side on Monday morning, December 3, 2018. Born in Maysville, he was a son of Loraine Kennedy Hord of Maysville and the late Eugene David Hord. David was a member of Hickory Grove Holiness Church in Tollesboro. He was a lifelong farmer who loved his family very much; and it was his family that was most important to him. Besides his beloved wife, he leaves to cherish his memory: his son, Bryan (Alexa) Hord of Tollesboro; his daughter, Amanda (Mark) Fogleman of Tollesboro; his precious grandson, Bentley Alexander Hord; his two sisters, Beverly (Gary) Cooper of Flemingsburg, and Brenda (Keith) Kirkland of Flemingsburg; his brother, Johnny (Rhonda) Hord of Tollesboro; an uncle, Harold (Elizabeth) Hord; aunts, Madeline Logan, and Marjorie Kennedy; and several nieces, nephews, great-nieces, great-nephews, and cousins. Besides his father, he was preceded in death by several aunts and uncles. Funeral services will be 2:00 pm Thursday, December 6, 2018 at the Hickory Grove Holiness Church officiated by Bro. David Hickerson. Visitation will be 11am-2pm Thursday at the church. Burial will be in Hillcrest Cemetery. Serving as active pallbearers will be Mark Fogleman, Robbie Hord, Eddie Toller, Jeff Hord, Michael Hord, and Dwight Malone. Honorary pallbearers will be T. B. Applegate, Frankie Vice, David Henderson, Doug Toller, Harold Hord, and Terry Thomas. Memorials are suggested to Hospice of Hope, 909 Kenton Station Dr., Maysville, KY 41056 or the Cancer Care Club, P.O. Box 189, Flemingsburg, KY 41041. Funeral arrangements are in care of the Carpenter-Fritz & Vice Funeral Home in Flemingsburg. Visitation will be 11am - 2pm Thursday, December 6th at the church.